Providing greener materials handling solutions for outdoor applications, Carer created the a 22,000 lbs. capacity alternative to internal combustion forklifts. The A100X electric forklift easily navigates uneven terrain and extreme outdoor environments without compromising performance or torque. 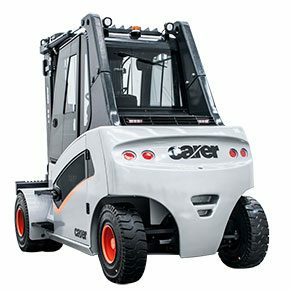 Designed to replace internal combustion forklifts that operate up to 4,200 hours per year, it features a unique 96V operating system with two standard 48V batteries. Featuring two 15kw traction motors with planetary drives in unique independent drive units with hydro-drives, the A-series offers enhanced traction control, maneuverability and optimum power consumption. Carer’s A100X electric forklifts consistently provide the torque needed to manage the most challenging applications, with IP54 protected drive motors that reach up to 5,400 rpm. They have travel speeds up to 20 km/h and lifting speeds up to 30 m/sec, as well as large diameter, solid, super-elastic front and rear tires. This ensures that the A100X provides operators with similar ride characteristics but better traction than their pneumatic tire counterparts. The A-Series comes complete with integrated rear-view cameras, fingertip controls and exceptional visibility. Operator comfort is ensured with ergonomic, fabric heated seats, air suspension and lumbar support, giving operators the tools they need to safely and efficiently navigate long shifts and uneven terrain.